The St. Clair will resume operation to Gunn’s Loop (west of Keele) starting June 30, 2010. I will update this post with observations, and invite comments from riders. The Metrolinx Board will meet on June 29. This article is a preview of the agenda, and I will report on the meeting itself later in the week. George supports constructing the Waterfront LRT by 2015 which will enable Torontonians to get to Cherry/Clark beaches and enjoy themselves. I hate to tell the campaign folks, but the Waterfront LRT ain’t going near Cherry Beach for a very, very long time. The Cherry Street extension will run initially from King south to the rail corridor, and the Waterfront east line will go from Union to Parliament. Both of these will be joined up as part of the Lower Don Lands revitalization that restructures many roads and improves connections under the railway. Much, much later, the Port Lands service will come in, but it won’t likely make it to Cherry Beach for a few decades, if ever. Meanwhile, the Waterfront West line is in Transit City limbo with no funding, and an implementation date off in the late 2020s. The route will not, if the TTC has its way, serve the western beach, but will muscle its way through the Queen and Roncesvalles intersection, and proceed out via The Queensway. The route along Lake Shore to Colbourne Lodge Road is so much better, but that’s a “Miller” plan and therefore not likely to be found in Smitherman’s platform. The Toronto Star reported today that an article (Only a Radical Approach Will Fix Toronto’s Transit Woes) written by Rob Ford’s Director of Policy, Mark Towhey, back in February does not represent the Ford campaign’s position on transit. For the record, I attempted to get the campaign to react to this article by writing to the ever chatty candidate on June 17, but heard nothing in return. The Star was a bit luckier. Ford and Towhey don’t have much use for the media, or anyone whose political leanings could be described as left-leaning, and so I may not be one of the people who “count” in Ford’s political analysis. Ford’s official position seems to consist of little more than scrapping anything that even vaguely resembles a streetcar, building subways, and having the TTC declared an essential service. I will not do Towhey the honour of dismembering his drivel at length, and leave it to readers to peruse his attitudes. They show a profound disrespect for people who use transit and for spending on anything other than the most obviously money-making ventures. The idea that transit is a both a service and an investment in the city is utterly foreign. In an election year, the exclusively left-wing political elite on the TTC board are [sic] ducking for cover. If Towhey had done the most basic homework, he would know that the TTC board includes such flaming lefties as Peter Milczyn and Bill Saundercook. They may be in a minority, but that’s also the makeup of Council. An “exclusive left-wing” board it is not. They argue strongly, and sometimes successfully, for their positions. Apparently, there is a General Manager (a position that was high profile a number of years ago, but has since subsided into irrelevance,) however I can’t find anyone who knows who this person is, nor what he (or she?) does. Gary Webster, who is frequently quoted in the media, will be surprised to learn that he is unknown. He is hardly irrelevant. In fact, 16 per cent of the $9.2 Billion (yes that’s Billion with a ‘B’) 2010 operating budget of the City of Toronto goes to keeping the TTC rolling. Well, in fact, that number is the gross cost of running the TTC, not the net cost after you include the farebox revenue (which also shows up in the City’s books along with property taxes and all of the other fees, subsidies, contracts, what-have-you). In fact the net cost of running the TTC is considerably lower than the cost of running the police force which gets almost no subsidies from anywhere. This information is easily available in the City’s budget background information online, and one would hope a “director of policy” might be somewhat familiar with how the budget works even if his boss isn’t. On the capital side, City Hall will spend $1.33 Billion this year alone to purchase new buses, streetcars and make other capital investments in TTC infrastructure. These are real dollars and they are driving out-of-control increases in property taxes that are forcing Toronto residents, and especially its small businesses, to begin planning an exodus to the outer suburbs. Yes, the Capital Budget for TTC this year is $1.33-billion, but that’s the gross number. Over half of this will come from Queen’s Park and Ottawa, some via the transit share of the gas tax, some via project-specific funding (such as the Spadina Subway), and some through a grab-bag of other funding schemes (see TTC Capital Budget for details). Towhey proposes that all funding for the TTC be cut off on April 1, 2011. I am not making up this date. He would sell the TTC and use the proceeds to pay down various municipal debts. The fact that these debts and liabilities include many related to the TTC itself seems to have escaped him. Moreover, he forgets that large chunks of the TTC were paid for by other governments who might ask for a share of the proceeds. But how will people get to and from work, shopping, school, etc? Good question. I imagine more people may drive — so some of the billions the city saves should go to improving its roads. Others will be forced to use bicycles, hire more taxis, join car pools, etc. Apparently, that’s good for the environment, even. Bonus. What is utterly missed is that the idea that transit might be a general benefit like water, or a fire department, or even roads. Taxis are a prohibitively expensive way to get around, especially for long trips. Car pooling has its limitations, especially for non-commuting trips, and we all know what Ford’s attitude to cyclists is — put them anywhere but on a road that might go someplace useful. I want a fast, convenient and affordable way of getting from the door of my home to the doorway of my workplace, shopping centre, school, theatre, friends’ houses, etc. That’s what the TTC should be providing: door to door solutions. The subway has value only when it’s delivering this. Ditto buses. Ditto streetcars. Door-to-door service will not be provided by transit, ever. If Towhey had wanted this, he might have at least advocated for land use controls that would make it possible, or at least cheaper. Of course, in his world, all of this will be provided by the private sector. Many bus routes, however, would be abandoned. They’re not profitable. Such is life. 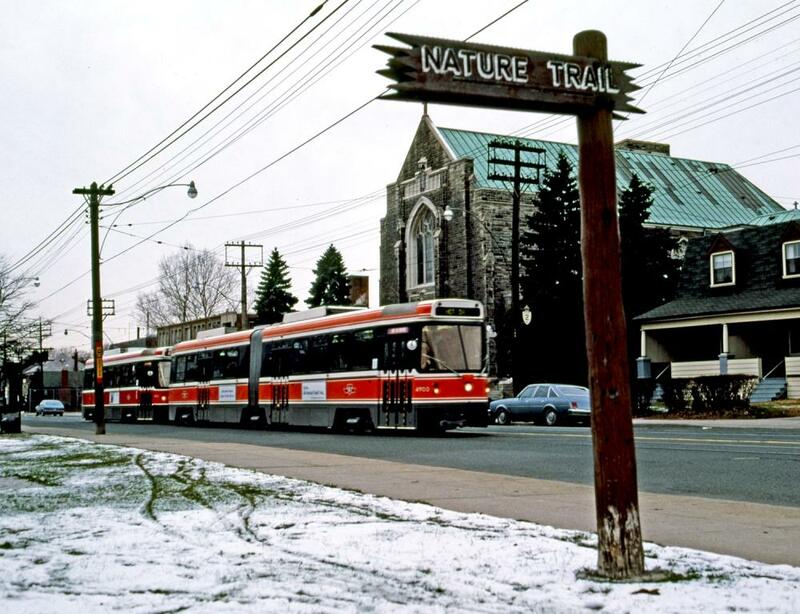 The TTC should have dumped these routes long ago. But what about the people who need them? Well, life’s tough. Instead of being the only three people on a 60 passenger bus, perhaps these people will have to introduce themselves, get to know their neighbours and share a taxi. Yes, life is tough, and it my profound hope that the citizens of Toronto dump Rob Ford and his Director of Policy for whom large chunks of the population don’t warrant their attention or public spending. Recently, I received a comment that the hyperlinks in articles are not always obvious given that unvisited links are in green and not easily spotted in the body of an article’s text. I have tweaked the style sheet so that these links are now underscored. As the Mayoral campaigns of various candidates meander toward October 25, I can’t help noticing a common thread in the transit platforms of the major candidates. Actually, a missing thread. Everyone loves to draw a map. Pull out a magic marker and a map of the city, cross out a few “David Miller” lines to show you’re an independent thinker, draw in a few of your own, and Voila! You have a transit platform. Some candidates talk about quality and reliability of transit service without saying exactly what they mean. One would give seniors a free ride for four hours a day. One would integrate TTC and GO fare structures and operations. But the real debates, as I saw just this morning at yet another joust for three would-be Mayors, turn on maps and funding. Large swaths of Toronto will never see rapid transit, whether we use that name for full-scale subways, or LRT, or BRT, or jet-propelled Swan Boats. Riders living there will put up with local bus and streetcar services forever. There may be a new subway or LRT down the street, closer than today, but not in walking distance. What we don’t hear in the debates is a sense of that much-hated word “vision”. What role does transit play in the city, not just today but in decades to come? What does “good service” mean? How much are we willing to pay for a bus every 10 minutes or better at midnight? How much of the cost should be paid by governments as an investment in mobility and enabling transit lifestyles, and how much should be paid by riders? Drawing lines on a map looks good, at least to people who live near the projected routes, but unless there’s a lot of them, and a mechanism to pay for their construction, they’re just doodles to most transit riders. Doodles, moreover, of lines that may not open until the would-be Mayor has been driven from office by a newer municipal saviour. My question to those who would be Mayor is simple: what will you do to improve transit today? Be honest about fares. Will you raise them? Will you charge by distance? Will you get rid of the TTC’s arcane transfer restrictions? Will you truly integrate GO and TTC fare schemes in a way that is attractive to riders? Don’t tell me about Smart Cards, whether it’s Queen’s Park’s Presto or a new Open Payment system. Tell me what your philosophy of charging for transit really is. Once we know how you want to price transit, we can work out how to collect the fares. Be honest about service. People love subways. They run until almost 2am with trains every five minutes. There’s even a big three-way meet of last trains at Bloor-Yonge. No wonder people want us to build subways — they guarantee the TTC will run vastly more service than, were it a bus or streetcar route, the corridor would see. If you’re a suburban bus rider, don’t count on frequent service or protected connections. What is “acceptable” service in frequency, crowding and reliability? How long should someone wait for a bus to show up? Should they be guaranteed a seat outside of the peak period? Should reliable schedules be enforced for infrequent routes, and should frequent services provide a reliable headway between vehicles? What does “transit priority” mean to you? Will you take capacity away from other road users to speed transit operations, especially in locations that are already congested and transit service is often delayed? Are streets more important for parking and deliveries, or for moving vehicles? What is your attitude to pedestrians? Transit users make their trips as pedestrians walking to and from stops and transferring between routes. Should access to transit be easy and comfortable? Are pedestrian spaces important for you, or do they get the leftovers? The next time you hold a press conference, go to a corner that doesn’t have a subway or an LRT today, or on any map, not even on yours. Explain what you will do to make transit better for that community. In between rants about making City Hall more accountable and tightening our belts, explain just what this will mean to people who don’t live on your rapid transit network, who won’t benefit from all the capital spending you plan to squeeze out of Queen’s Park and maybe, just maybe, Ottawa. When the new buses start running, when the service improves (even on the Queen car), then we’ll hold a photo op for you. Think how many neighbourhoods you will visit with your better bus and streetcar service! And you might even do it before the next election!! 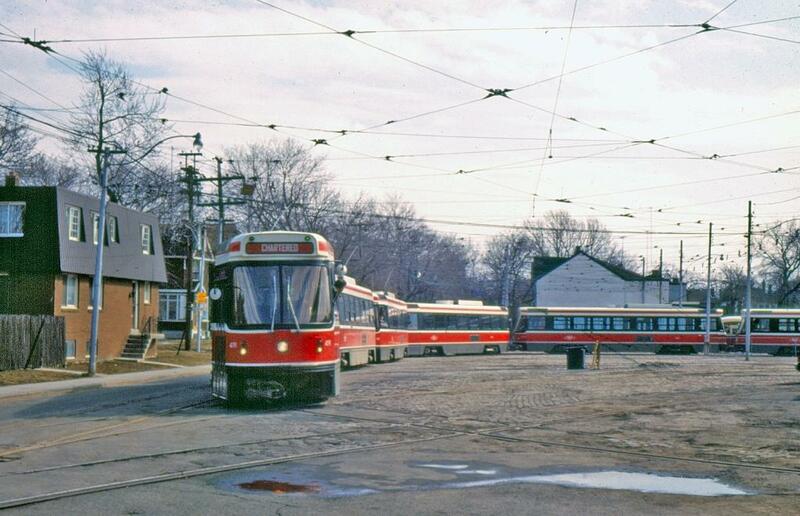 Following up on the comment thread about new Transit City LRVs, John F. Bromley sent along two photos showing MU operation of the “legacy” fleet. Here is a two-car train consisting of ALRV demonstrator 4900 plus CLRV 4152 eastbound on Kingston Roat at Hannaford on November 28, 1982. Note the electronic destination sign on the 4900. Note: I will move all of the comments related to MU operations of the legacy fleet to this post. As the term of the Miller Council winds down, I thought it would be interesting to look back at an important document that came from David Miller’s days on the TTC Board. In the early 2000’s, we were still recovering from the Harris funding and service cuts, and the TTC really needed to move beyond just keeping the lights on and the wheels turning. The Ridership Growth Strategy was conceived as a way to advocate and advance a menu of low-cost options to make the system more attractive and build ridership. Competing proposals crowded out the discussion space. The RGS brought together many proposals so that their costs and potential effects could be compared, and a multi-year implementation could be planned. Here is a short overview, from my viewpoint, of where things stand. Much has been done, although there are still holes to be filled. Looking back from 2010, the RGS is a rather conservative set of proposals, and yet it was considered radical at the time. Probably the saddest part in rereading RGS is not the table of improvements, but a description of why people ride transit. The Ridership Growth Strategy focuses on improvements to service quality and speed, and on fare incentives that will be feasible and cost-effective in attracting new riders. However, the TTC’s operating practices, business culture, and sensitivity to passenger needs — factors that will affect the TTC’s ability to be a serious travel option in Toronto beyond the medium term — must reflect and continually adapt to the needs and expectations of its changing passenger base. Critical to attracting passengers are efforts to improve the comfort, reliability and convenience of service. The TTC has made, and continues to make significant efforts to achieve this goal. A major initiative regarding route management, strict monitoring of service reliability, ongoing, major improvements to terminal operations at a number of stations, improved configurations of buses and streetcars, more comfortable seating on new vehicles, and the commitment to buying only low-floor fully-accessible vehicles are examples of these efforts. The organisation must continue its work in these areas. The attractiveness, cleanliness and ambience of subway stations and trains is very important to passengers’ overall travel experience. The TTC’s recent initiatives regarding station renovations, overall lighting, rebuilding of escalators, recycling of newspapers, enhanced station cleaning, installation of elevators, and acquisition of roomier and brighter “T-1” subway cars are examples of important work in this area. Again, these initiatives must be continued and strengthened. Communicating effectively with passengers contributes to their satisfaction with the TTC. A number of initiatives, all of which will require new funding, have been identified as having the potential to provide significant customer benefits. These include improved and more effective signage within subway stations and system-wide, continued expansion and improvement of the provision of electronic information through the TTC’s web site, electronic displays of vehicle arrival times within subway stations and on-street at stops, direct marketing of community-specific service information, and automated announcement of stops in the subway system. Passengers need to know that safety and security are top priority in the TTC system, and a number of initiatives in this area have contributed to the TTC system being widely regarded as extremely safe. These include increased presence of security personnel throughoutm the system, introduction of the “request stop” program, more closed-circuit surveillance of station areas, the establishment of “designated waiting areas”, and the installation of platform edge markers. Again, efforts and resources targeted at increasing system safety and security should be increased in order to meet or exceed passengers’ expectations in this area. The desire to improve the quality and friendliness of the service which the TTC delivers must continue to be engendered in all employees — management, staff and union. The Awards of Excellence program, which recognizes employees who have provided truly excellent service according to customer commendations, is a key tool in this drive. Also critical is the TTC’s ongoing program of employee training and develoment. These and other initiatives to inculcate an unwavering commitment to satisfying customers must be supported, strengthened and accelerated. This text was written over seven years ago, and we all know that the TTC has a long way to go on many points. Indeed, they have slipped from “the good old days” in some areas rather than improving. There are improvements, notably the amount of service. The TTC’s passenger information systems, including its website, crawl slowly into a reliable and useful state. However, the “business culture” of the TTC remains inward-looking, often too ready to blame any problem on forces outside of the organization. In a few months, we will have a report from the Customer Service initiative, and there will many fine words and much back-patting. Whether we will see anything concrete beyond half-implemented changes — do the easy stuff, but never quite get to the hard parts — remains a matter of conjecture and faith. Next year, there will be a new crew at City Hall, and with them, no doubt, changes at the TTC including demands for better accountability. The “business culture” may be in for a shakeup, or like large organizations everywhere, it may bend those who would change it to a safe, corporate outlook. Upheaval for its own sake is dangerous and destructive, but the TTC needs a wakeup call when so much remains only words from a seven year old strategy.